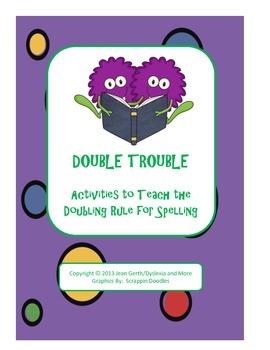 "Double Trouble" teaches the doubling rule for spelling. 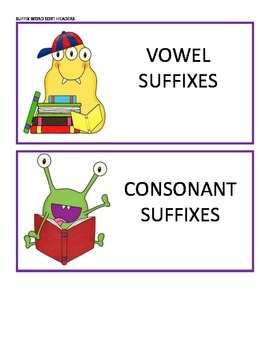 Students need to know the types of syllables and whether the suffix is a "vowel suffix" (begins with a vowel) or a "consonant suffix" (begins with a consonant). Then they look for words that fit the 1:1:1 rule - 1 syllable (closed or vowel-r), 1 vowel, 1 consonant. If a word is a 1:1:1 word and you are adding a vowel suffix, you double the final consonant in your base word. 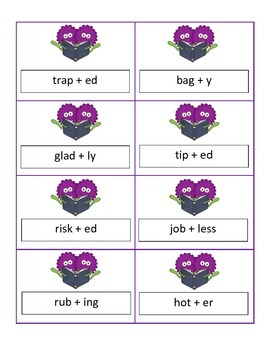 This file contains a suffix sort for "vowel suffixes" and "consonant suffixes", suffix cards for sorting, a word sort for whether words fit the 1:1:1 rule or not, word cards for sorting, and a card game "Double Trouble". In "Double Trouble" students draw a card that has a word and a suffix on it. They have to tell whether to double the consonant or not, and why. If they draw a "Double Trouble" card, they get to draw two additional cards. The student with the most cards at the end is the winner.